Do you, your loved one or someone you know need immediate financial assistance? The Tzu Chi Foundation (pronounced “soo chee”) is a non-profit humanitarian organization that is willing and ready to provide some financial relief directly into the hands of disaster survivors as quickly as possible. 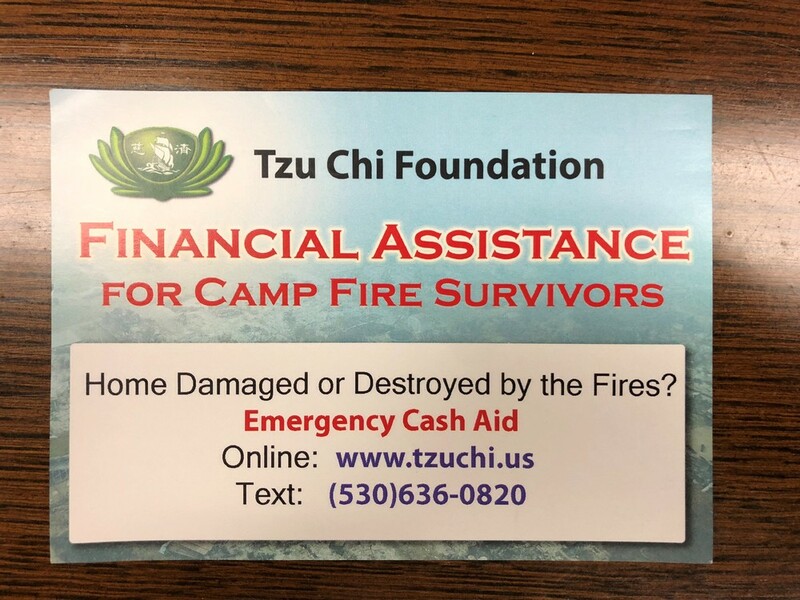 If your home has been damaged, destroyed or you have been displaced by the Camp Fire, you are eligible to receive immediate financial aid in the form of a cash card from Tzu Chi USA. Tzu Chi also welcomes residents of Magalia, Concow and Yankee Hill to register for aid. Tzu Chi USA has made the registration process simple and they ask for very little information in order to receive the aid. The Tzu Chi Foundation has already helped many people in our area and they are determined to surpass their goal of getting cash cards into the hands of 10,000 people by the end of this weekend. Please help spread the word, the Tzu Chi Foundation will be here for assistance until the Disaster Recovery Center closes.